In the last few days, i have been so busy working on my thesis (both coding and reports), preparing for next week final exam and also preparing for next semester materials. It consumes lots of my time and sometimes i had to sleep at morning (past 00:00 AM). Today, i'm not feeling well and i got a cough and also influenza. Let's hope it will be better tomorrow, as i have a job tomorrow at my campus. Lately, i saw spammers re-entered Indonesian Linux forum again. I didn't realize that when i upgrade the forum, i override the file that should load the Advanced Textual Confirmation code as well. The result was ATC installed, but it wasn't loaded by the phpBB scripts. Right now, i have re-added the script and hopefully those spammers won't be able to pass the protection i used for the forum. OLPC shocked the world by making US$100 laptops (which finally released above US$100). This idea is then followed by other vendor that tried to make small and cheap laptops for children and growing nations. Well, guess what? India is developing US$10 laptop. I wonder what will the specification be . It's not a joke since it came out from minister of the federal government. The research is done by Indian Institute of Science in Bangalore and the Indian Institute of Technology in Chennai. Final version of KDE 4.1 has been released officially today. It was on schedule release (great job to KDE team), but don't think that 4.1 will have all the functionality that you might expected as in 3.5. KDE 3.5.x is a very mature release and it would take some time to make all of the features in 3.5 to be implemented in 4.x. The feature plan document lists all the features list along with the current status. Most of them are marked DONE, but some are still in progress and also in TODO list. At least for now KDEPIM is back and people who used KMail or Kontact can use it again as they have been restored in 4.1. For application that didn't make it into KDE 4.1 will have to look on this Schedule Plan. It includes big pile of major application, like Amarok, KOffice, K3B, Kaffeine, and KDevelop. Still not convinced with KDE 4.1? You can wait for the next update in October (KDE 4.1.1) or KDE 4.2 in January 2008. If you are still using KDE 3.5.x and feel that it's the right version for you, then don't worry that it will abandoned. KDE team is planning to release an update to KDE 3.5.x, which will be KDE 3.5.10 and it is scheduled for August (that should be in a few days, but we don't know the exact date yet). My computer at the office which i used as a mini repository is now broken . When i used it this morning, it hung up and when i tried to restart using the reset button, it works, but the screen was displaying strange output. I decided to stop the process and shut it down to prevent further damage. I'm pretty sure the hard drive is still OK. I suspect the VGA or the monitor which is damaged. This morning, i helped one of my student to install Slackware 12.1 on his laptop. He had a nice Acer Aspire laptop (i forgot the series). The installation was very fast, due to high specs he had. By default, Slackware comes with vesa driver and i simply install the NVidia 173 driver and without any problem, i can load the new driver and also modifying the X configuration to use higher resolution (he used 1280x768). Another good thing is that almost all the hardware is already detected by the operating system, leaving him with wireless which i hadn't tried. I had no experienced with Intel 3945, but as far as i seen, Intel has developed a good driver which is already included in the Linux kernel, so no more pain like in the old ipw2100/ipw2200 case (which right now also managed to be included in the Linux kernel). Everything seems so smooth, including when executing OpenOffice.org which is well-known of slow application compared to other office suite. Curious about Computer or Internet-related news? Perhaps you should add this site to your read-list or even better, add their RSS Feed into your RSS Aggregator application and ask them to update it once every hour or so and you will get lots of updates about Computer and Technology, mostly are Open Source and Linux news. There are several blogs that has been registered. I was asked by Susan of TechnoSnack to join the aggregator, but unfortunately this blog is not talking about computer and technology exclusively. Sometimes i did put some technology-related news, but that's not everyday. Congratulations for OpenOffice.org which won in three different category. In the past, people who had wireless card with Atheros chipset would have to use drivers from MadWifi if they are using Linux platform. Soon, their pain will be cured as Atheros is bringing on athk9 to the community. This driver is aimed at inclusion to the Linux kernel and supports all Atheros IEEE 802.11n devices. There are still a plenty of work to be done, but they will work out this problem with the community to get the best of linux driver for wireless card with Atheros chipset on it. For more information, please refer to this site. I might say that this driver is being prepared to be included when 2.6.28 merge window is opened by Linus in about two months from now. Probably it's too late for them to include this big changes in 2.6.27. They also have plenty of time to work on the code, including making it compliant with Linux kernel coding standards, working on documentation, and finishing the basic feature that are mostly used by people. Marco Zehe wrote on his blog about better accessibility support in Firefox 3.1. There will be text attributes and spell checking support!. This means that assistive technologies now have access to the attributes of any text run on a page. 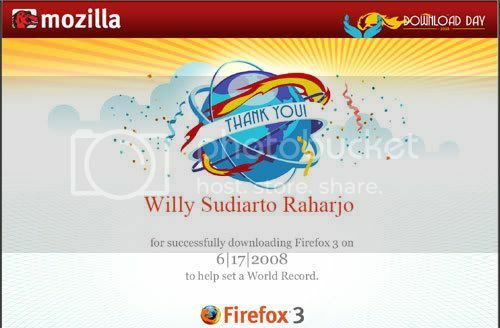 This patch has been included in Firefox 3.1 Alpha 1 (Mozilla/5.0 (Windows; U; Windows NT 5.1; en-US; rv:1.9.1a1pre) Gecko/2008071803 Minefield/3.1a1pre). So far, i used Better GMail 2 extension to add several features in GMail, for example HTTP Support to encrypt all my data across the wire(less) communication. Some of these features are being integrated by Google Developers, meaning that more function is already available on GMail (some of these features are still in GMail Labs, waiting for better testing by people who used GMail around the world). Today, GMail added new feature to their GMail product which was already included in Better GMail 2, which is HTTPS Support. By enabling this feature, all of your activities will be placed in https protocol rather than the default http (in the past, GMail only use https when you logged in and after that, they will switch to http unless you said to use https). The reason behind this is that https works with encrypted data, so it will take time to decrypt the data. It's not efficient if you use https all the time if you are working at home. But if you use public hotspots, then https is a must. Another project from Washington University called WebAnywhere. What is this project? WebAnywhere is a web-based screen reader for the web. 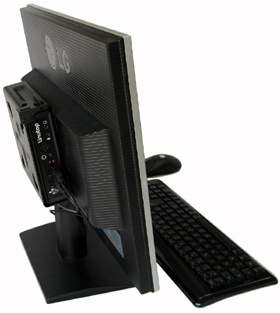 It requires no special software to be installed on the client machine and, therefore, enables blind people to access the web from any computer they happen to have access to that has a sound card. No $1000 software program required! WebAnywhere's will run on any machine, even heavily locked-down public terminals, regardless of what operating system it is running and regardless of what browsers are installed. You might want to try this alpha release here (online, no installation needed). I have tested and the result is great, except that it won't read iframe currently. The speech engine is clear for almost every words. This project is now hosted at Google Code, so you can download the source, play with it, and contribute to the project. Ever feel worried about your laptop being stolen? Yes, you should. Statistics said that every year, number of stolen laptop are increasing. This happened not only in the big countries, but also in small countries or developing countries. What can you do? Adeona is the first Open Source system for tracking the location of your lost or stolen laptop that does not rely on a proprietary, central service. Adeona is designed to use the Open Source OpenDHT distributed storage service to store location updates sent by a small software client installed on an owner's laptop. The client continually monitors the current location of the laptop, gathering information (such as IP addresses and local network topology) that can be used to identify its current location. The client then uses strong cryptographic mechanisms to not only encrypt the location data, but also ensure that the ciphertexts stored within OpenDHT are anonymous and unlinkable. At the same time, it is easy for an owner to retrieve location information. This application can be installed on Windows, Mac OS X, and also Linux. But you will need several tools installed for Linux, for example Cron for scheduling, traceroute, openSSL, and also iwconfig (optional). You will also need an Internet access to be able to track your laptop, since it will gather the data and send them to the server which will then track the location. Yahoo Messenger has a Buzz function to get attention from other people. This function will make the chat window became active and shake for few seconds. This way, it will make the other party gets "disturbed". This function is really useful, but it could be annoying, mostly when you are at work and there's people who keep buzzing you and hoping that you would reply their question (well, it doesn't matter if the question is important, but what if it doesn't?) Of course, this feature can be disabled on the settings. Otherwise, it can be used to make people upset . Sometimes, people asked questions without asking whether the other party has time or not. And they keep buzzing like crazy . I just hate it when people do that. Finally, my membership for IEEE and ACM has been approved. I just got my membership card from IEEE, which was sent about two weeks ago. Too bad, i registered a little bit late, so my membership will only be available until December before i have to renew again (this only happened in IEEE, but not in ACM which gave 12 months of membership since the date you are approved). There was a long story to get this membership, since they had problem with my credit card here in Indonesia, same problem i had when i bought something from the Internet. Well, at least they confirmed that my cc is valid and i got my membership done. In less than a week, KDE 4.1 is ready for their debut for public usage. I believe there will be a massive reviews about this release, as it's a big milestone and the developers has stated that this release will be the public release that can be used for home users and not for developers (like in the previous 4.0 release). Many have said that KDE 4.0 is bad, and other said it's a promising KDE release. We will found out more about KDE 4.1 when it's released. Right now, they have released RC 1, which i predicted will be followed by RC 2 shortly, just to make sure all the major bugs have been fixed and no massive regression left. Thanks to the merge of gspca drivers, the next stable Linux kernel, 2.6.27 will support most web camera available on the market nowadays. These drivers will support many devices and it will be added in the future (remember, new drivers are being added constantly every cycle, mostly in merge window). Even though i don't have web camera yet as of now, this kind of work will make me measier to choose which product i should be in order to work in my Linux box in the future (when 2.6.27 shipped, which is about 2-3 months from now). Future laptops should be more functional, as more and more drivers are included in the kernel, so most of the devices should work out of the box after installation process. This should make switching to Linux become easier. Lately, i have a feeling that my Internet connection (Speedy) is getting slower than usual. My students informed me that if we turned on the modem we used for 24 hours, the speed will drop. I don't know what theory is being used to make that conclusion, since i have been using my modem for few months and most of the time, i never turned it off (neither did my computer). But lately, the connection speed is really dropped compared to 1-2 months ago. Speedy has upgraded their bandwidth to 1 Mbps few month ago and i hope it's not just a marketing tools to attract more customers. Any other Speedy customer feeling the same experience? I went to Amplaz again to watch Red Cliff, a movie about three kingdom, which is a legendary Chinese story. When i was walking at the mall, waiting for the movie (i went there earlier to avoid busy hours during weekend), i saw funny thing. I looked at Batik Keris. They had a nice Wayang model and below the model, it's said "Memecahkan berarti membeli. Breaking is Buying." Finally i had a chance to see Batman: Dark Knight which has been on the movie theater since last Thursday. Some of my friends has seen this movie and they told me that it was a good movie (probably the best and most expected movie in 2008). I was kinda worried, since people's enthusiasm on watching this movie in Jogja is so high. My students who bought the ticket went there at morning and all of the seat for 4 PM show was already full. We finally got the next one (7 PM). So we took that seat. I arrived at Amplaz around 5 PM, since i wanted to have dinner and also i wanted to avoid the crowded street and also parking area. It's very messy when you go to Amplaz around 6 - 7 PM, since lots of people would go there. My students who bought the ticket went there around 6.20 and he arrived at 7 PM at the 21. Lucky us, the movie hasn't started yet. I just finished upgrading Indonesian Linux Forum to the latest version of phpBB (3.0.2). Actually, i found out that there's a new version of phpBB accidentally. I just check the system tab and i saw a red note saying that my installation is out of date. I rushed to see the changelog and grab the files. Interestingly, phpBB has a good mechanism to update your installation. You can use the full package (it's best option for new installation though), changed file only (contains only those files changed from previous versions of phpBB3), patched files (contains patch compatible patches from previous versions of phpBB3), automatic updates, and code changes. In the past, i used the changed file only, meaning that i must re-add my MODs after i upload the new files, which is quite boring at time wasting. Congratulations to phpBB team. They have made Olympus a great product with great upgrade mechanism. Less than a month since their debuts, first maintenance updates to Firefox 3 has come up with three critical vulnerabilities. One of them only affects Mac OS X while the remaining applied to all OS. Well, i finally finished my participation on BootCamp. I stayed there for two days, and now it's time to go back home, finish all of my pending works, reply incoming emails, and many more to do. I have finished most of it, but there's still some papers to be verified and i will do it in this week. Meanwhile, this weekend, my group will have a presentation, so i also had to prepare all the things. OMG, just two days of vacation and everything has already piled up. At least i'm home now, so i can do more work than i did in Kaliurang. Firefox is very customizable, but not everybody knows how to tweak it. Koroush Ghazi has created a Firefox Tweak Guide to be used by everybody which can be downloaded and read. It consists of 13 cool chapters. It's a must-read article if you like to tweak your own Firefox. He used Firefox 3 as the basis of this article, so i guess it won't be much a problem, as most of you uses Firefox (i assume). Sometimes, we need to compute something fast and we don't bring our calculator with us. Google can help us, but it's limited. 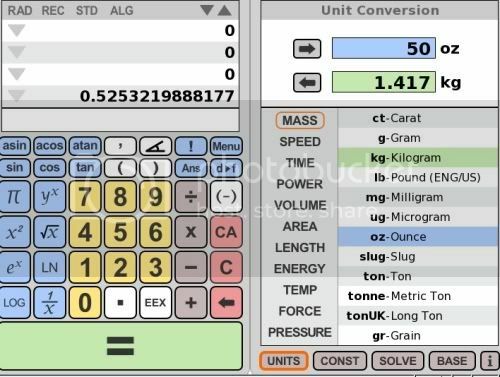 You can try to use this online scientific calculator to help you. 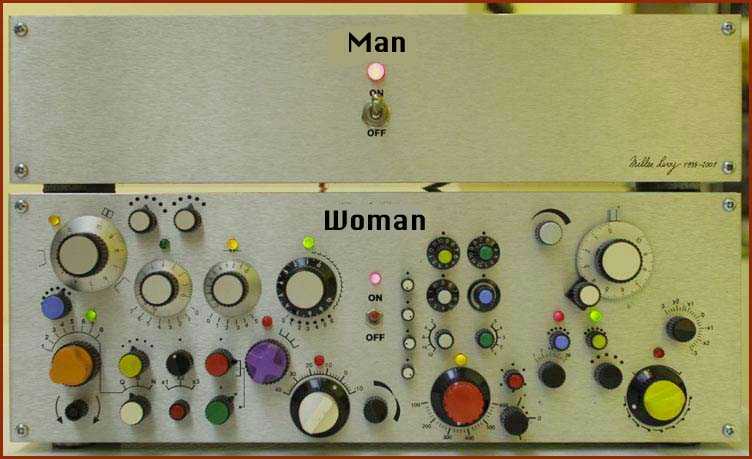 Man and Women has many differences. One of them is described by this picture. It's taken from Cliff Pickover's website via StumbleUpon. Well, it seems that Linus is quite convinced with the last RC with some small little addition afterward. He releases Linux Kernel 2.6.26, the final version after nine RC releases and results of almost three months of development by more than 150 kernel developers around the world. It's very fresh, so don't expect too much announcements on the web for now. You can see the official announcement from Linus himself at the LKML (Linux Kernel Mailing List). It's sitting there on the Kernel Main Page or if you are too lazy to go there, you can download it directly from here (links to the kernel.org page). I have been trying to use Compiz and i had two different results. At the first trial, it was a mess. No titlebar on every application, too much error/warning messages on the console, and many problems. I stopped using compiz then (besides, it's just a cool effect. It won't make my salary increased ). Well, cool desktop effects can be one simple promotion to attact people to use Linux. If you can do the nice effects without having to buy expensive hardware, what would you do? I'm sure many people who have tried to use Vista will be impressed by what Compiz/Compiz-Fusion can do with not so state-of-the-art hardware. Ok, enough about airport. After picking up, we had dinner at Lombok Ijo. We decided to ate there because it's new (they had their grand opening earlier this week) and some of my colleagues had recommended me to try out this restaurant. Because we were heading the same direction, so we stopped by. We arrived there around 9.15 PM, but it was still full of people. Next, we ordered some foods and drinks. It wasn't too expensive, so i guess that was the main interests. The guy came back saying that one of the menu we ordered was not available again. OK, i could accept that, because it's quite late. No problem, as we can order another one, and we did. Few minutes again, he came again and saying that another menu was not available. Well, another acceptance from us, so we took another one. Guest what order that didn't come out? It was Tahu Penyet and Tempe Penyet. Only a simple menu. With that many people working at the kitchen, i don't think it would take more than 1 hour to make that menu. Well, i'm quite disappointed tonight. I'd say 5/10. Next week, i will participate in my campus' bootcamp which will be held in GHCC Kaliurang (yes, three times in Kaliurang this month for my colleagues and two for me). Unfortunately, i will not be able to participate full time, due to my class in this short semester (second block). I will stay there at the first and second day, where i will be talking about introduction to software engineering (day 1) and also about Design Document (day 2). This is one full week activity, meaning the participant will be quarantined in Kaliurang and at the end of week, they will work in team to work on a small project which will be given at the first day. This is preliminary event. If this one is quite success, we will try to make this kind of event annually, so students can use their free time to work on something rather than just playing online game and wasting their precious time. It seems that GMail new feature about Phishing filter is not 100% working for all people. Abhinav.Singh still has a problem with Paypal which he posted on his blog. It's dated 8 July, so it's still fresh (only few hours after GMail announced their new filter). As you can see in the image, phisher usually uses undisclosed-recipient as the recipient and not our single email account because they sent a mass email to lots of people. So by looking at this criteria, we could reduce the risk by deleting or marking it spam. And also, PayPal usually write their customer's name in most of their email messages, so if you receive messages from PayPal without your full name, please beware. It might be phishing attempt. Update (10 July 2008 : 06:45): Thanks to Somesh for clarification. GMail seems to use filters only for emails that tries to camouflage as PayPal or Ebay and ends with @paypal.com or @ebay.com (email spoofing), but emails that tries to camouflage as PayPal or Ebay and uses domain other than paypal.com and ebay.com will not get filtered away (this is what happened in Abhinav's case with @online.net domain). Please pay more attention about this. Now any email that claims to come from "paypal.com" or "ebay.com" (and their international versions) is authenticated by Gmail and -- here comes the important part -- rejected if it fails to verify as actually coming from PayPal or eBay. That's right: you won't even see the phishing message in your spam folder. Gmail just won't accept it at all. Conversely, if you get an message in Gmail where the "From" says "@paypal.com" or "@ebay.com," then you'll know it actually came from PayPal or eBay. It's email the way it should be. New updates from Gmail Blog: Remote Sign Out, very nice feature for people who often too busy to logout from their GMail account, which can lead to abuse or misused by other people (if you are in public area, like in Internet kiosk or at school). By using this feature, you can see your account activities if you logged in from other places. The best thing is that you can sign out remotely from your current place and the other session will also be signed out. It protects your account from being used by other people. Very nice feature huh? Linutop is a ready-to-use small computer, designed to reduce maintenance costs. The Linutop operating system is stored on an internal flash memory and cannot be altered by virus or mishap. Initial state can be recovered at each restart. Linutop is delivered with free standard ready-to-use Linux software: Firefox, Open Office, VLC Media player... and can be easily customized with additional software. Unfortunately, the shipping cost to Indonesia is quite expensive (EUR 150). It's more than 50% of the Linutop 2 price. It would be beneficial if you bought lots of them. You can just plug it on the back of your LCD monitor and it will work just fine. Also, it's very portable, because you can unplug it anytime and bring it on your backpack. Sometimes people are confused to find good resources which cover all aspects of web design. Well, if you are one of them, have a look on this site. It listed lots of good resources from Specifications related to web, HTML, CSS, SEO (Search Engine Optimization), PHP, Site submission to search engine, MySQL, Perl, Python, ASP, Accessibility, Character Encoding, etc. I was wondering why on earth Python and Perl are included in web design resources? Yeah, i know that Perl and Python can be used as well to create web pages using CGI, but i don't think many people uses CGI for developing web pages right now. They probably have switched to better technologies, like PHP, ASP.NET, or JSP. Final Fantasy VII is one of the most popular Final Fantasy series. First because it was the first edition that brings 3D graphics into Final Fantasy series. Since then, almost all following series uses 3D fully, except Final Fantasy 9 and 11 (Online version). If you buy a 2-day premium account, we give you a full day extra. Secure your 3-day account now for only 4.50 Euro! In the past, Premium and Collector's Accounts were only credited a RapidPoint when a file was downloaded by a Free User. From now on, Premium Downloads can generate up to 255 additional RapidPoints per day. Those extra points will be displayed in the account overview in the Premium or Collector's Zone. Once a day, the extra points will be added to the Premium or Collector's Account's RapidPoints balance and the extra points counter will be reset to zero. My requests of Ubuntu/Kubuntu CDs has arrived this morning. I only had to pay IDR 7000 as usual for re-package and shipment to my house. Just now, i got news that Ubuntu has updated their LTS version with their first maintenance updates, 8.0.4.1 (just like the Linux kernel naming scheme). Among the updates are Firefox 3 and also GNOME 2.22.2 which gets significant improvements. Other images will also comes up with an updates. So far, i have seen Kubuntu (i haven't checked the rest though). You can get the updates from the Ubuntu website or if you are in Indonesia, just point your browser to FOSS-ID which is connected to IIX and it should be faster than downloading it from outside mirrors. I'm downloading it from FOSS-ID even though i'm not Ubuntu/Kubuntu users. One of the most problematic for web designers are typography. It's related to fonts being used in a website. Different font results in different view and each browser (and also operating system) comes up with different font list, making it harder. Good for all of us that there are several "safe" fonts. When you use an uncommon font and the client doesn't have that font, the browser will use the closest one available on their list. To compare which fonts are good enough for your website, you can use Typetester, an online and live font comparator. Pick your font, size, and many other attributes and it will be displayed at your screen. Don't forget to download your very own certificate for helping set a Guinness World Record. Adobe has just released Adobe Reader 9.0 along with other products. The Windows version is already available for download (RS link), but unfortunately, the Linux version is not ready yet (i'm not sure when will it be ready). Lots of new features has been merged on this release, including Flash support, more media type, more layout design, and many more. You can see more details on Adobe's website. By eliminating the captchas we simplified the use of RapidShare's free services significantly. In addition, free-users can now upload and download bigger files (up to 200 megabyte). Anyhow, to protect RapidShare from congestion caused by automated downloading, we limited the maximum download speed for free‐users to 500 kilobit per second. To compensate for that, they do not have to wait anymore until starting a succeeding download. Premium-users now profit from more flexibility regarding the download volume: It used to be limited to 10 gigabyte per day and can be "saved" now to a maximum of 50 Gigabyte. As a consequence, the volume that was not used is transferred to the following day automatically, up to a maximum of 50 gigabyte. If the complete download capacity is used up during one day, the premium-user is able to save another 10 gigabyte the following day. You traveled a lot and sometimes you need references quickly? Probably Pocket Wikipedia is the answer for your problem. It's an offline version of Wikipedia which is customized to be installed on PocketPC (but it can be installed on desktop or laptop) and for education purposes. It will not be as accurate as the online version, as it has been reduced both in size and also in the content. The Selection (made by Schools Wikipedia) is about the size of a 15 volume encyclopedia with 24,000 pictures, 14 million words and articles on 4,625 topics. It includes the best of Wikipedia as well as many thousands of pages of extra material specifically selected to be of interest to children who follow the UK National Curriculum and similar curricula elsewhere in the world. Nevertheless, it's still useful if you need quick information without Internet connection. It has been configured to run on Windows and also Linux (because lots of handheld are now using Linux as the operating system). The application is available for free as BitTorrent download (2.5GB compressed with full size images) or HTTP download (792MB compressed with only thumbnail images) or on DVD from SOS Children’s offices. Finally, i'm back. It's been a busy two days since all of my daily activities were filled with meetings and lots of debate and discussion, but it has ended now . We stayed at YEU boutique hotel. It's not yet officially launched, but they have done soft launching. Since it's not yet finished, some part of the hotels were not yet available. Apart from that, this place is good for relaxing and getting out of boring activities in town. There's no TV set in this hotel. The only you get when you entered the room was only two bed rooms and one window . But, don't worry, since they have Internet connection ready (unfortunately, they didn't activate it yet for now, as the renovation process is still ongoing). The strength signal was quite good and i didn't have any problem getting the IP address. The problem is that they didn't activate it yet and i didn't get the user/password to access the Internet.